66 · The Mysterious Sketch · Erckmann-Chatrian; translated by Gordon B. Ringgold · ss; translated from the French (Lesquisse mystérieuse, Les Contes Fantastiques, Hachette, 1860). 81 · The Lavender Ones Taste Better · Joan S. Richter · vi; in EQMMs Department of First Stories. 84 · The White Elephant · Joan S. Richter · vi; in EQMMs Department of First Stories. 87 · Not a Bit Like Television · M. Brett-Surman · vi; in EQMMs Department of First Stories. 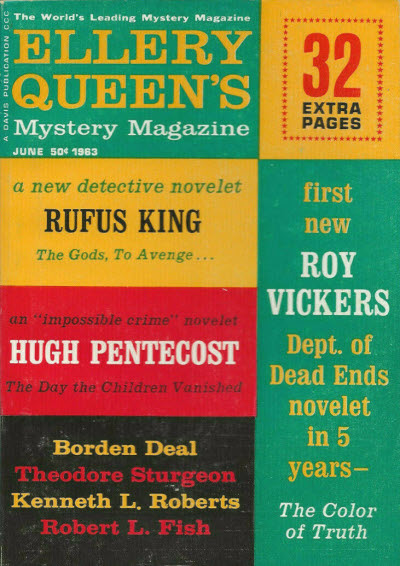 Given as v40 #2 in the Table of Contents. Details supplied by Douglas Greene. 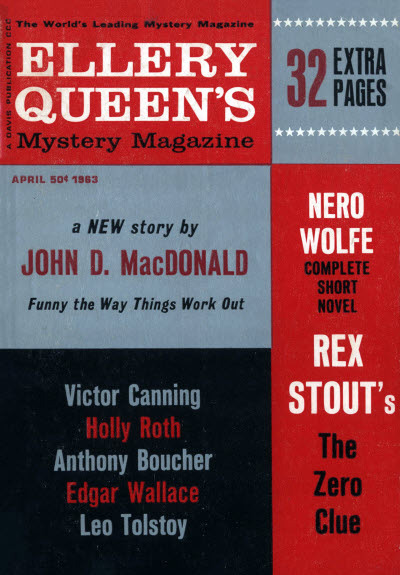 92 · A Lesson in Logic · Robert Pickering · ss; in EQMMs Department of First Stories. 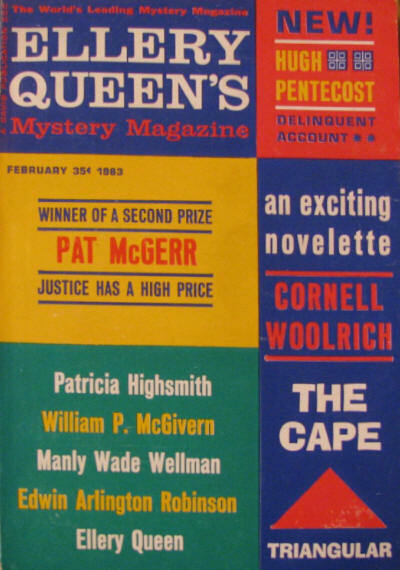 103 · Trouble House · Pat Wallace Latner · ss; in EQMMs Department of First Stories. 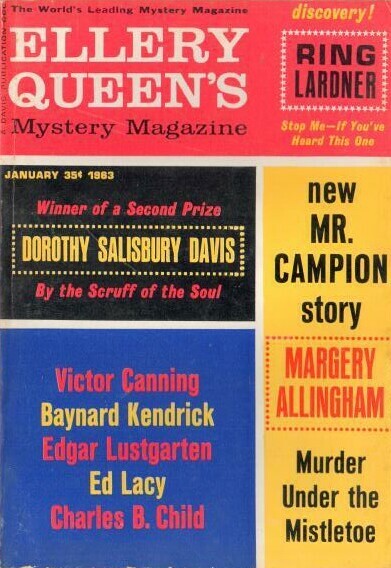 89 · Tear a Passion to Tatters · Raleigh Bond · ss; in EQMMs Department of First Stories. 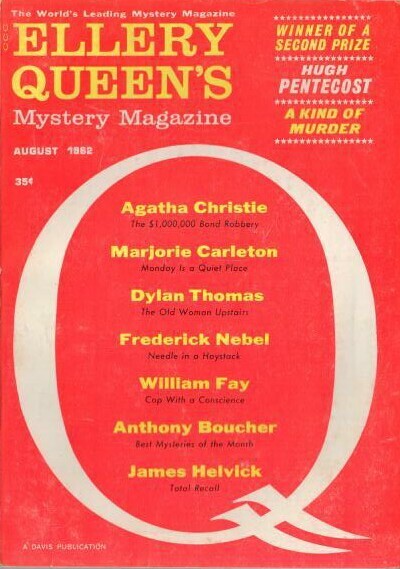 57 · I Will Please Come to Order · William North Jayme · ss; in EQMMs Department of First Stories. 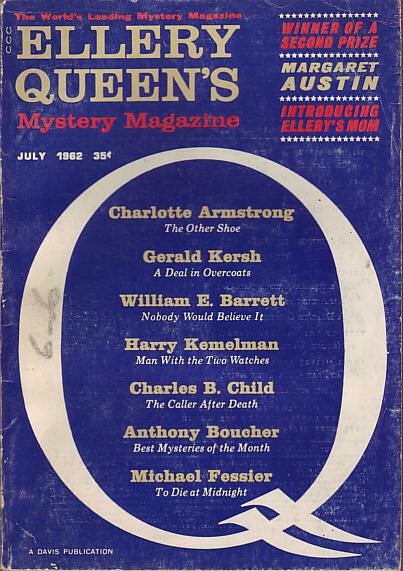 65 · The Man Who Heard Whispers · Edward Forbes · ss; in EQMMs Department of First Stories. 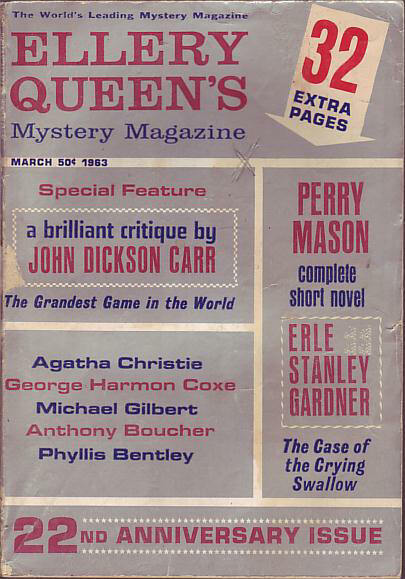 61 · Home Office: 221B Baker Street · Robert & Michael Zimler · ss; in EQMMs Department of First Stories. 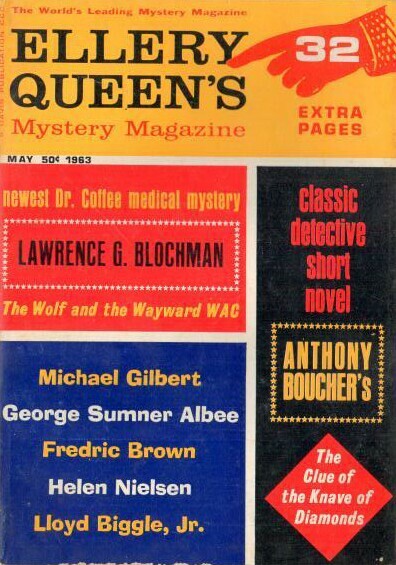 77 · The Day the Sheriffs Dog Died · Clyde Shaffer · ss; in EQMMs Department of First Stories. 82 · According to Plan · Jane Speed · ss; in EQMMs Department of First Stories. 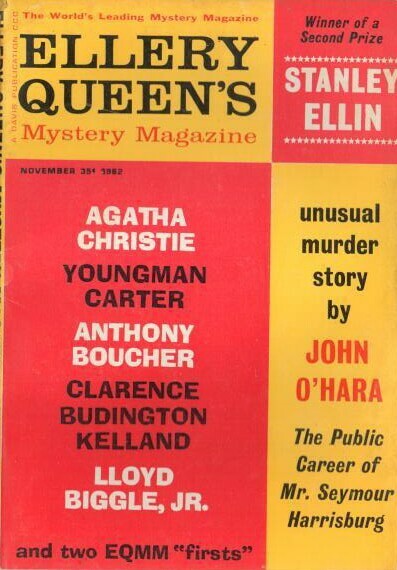 117 · Man on the Chancel Steps [Jane Marple] · Agatha Christie · nv This Week Sep 12 1954 (+1), as Murder at the Vicarage; not the same as the Jane Marple novel The Murder at the Vicarage. 67 · The Expense of Justice · Leo N. Tolstoy (error, actually by Guy de Maupassant) · ss (r); translated from the French. 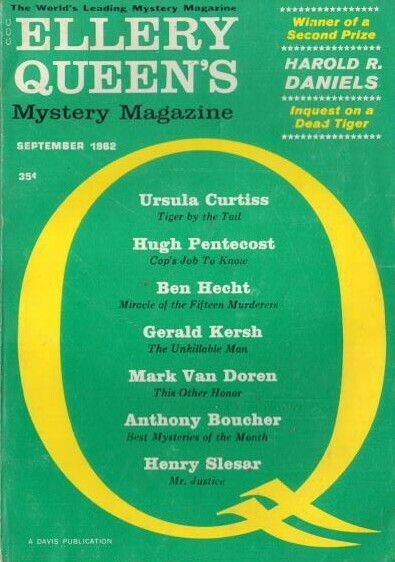 84 · You Never Can Tell About People · Susan Sears · ss; in EQMMs Department of First Stories. 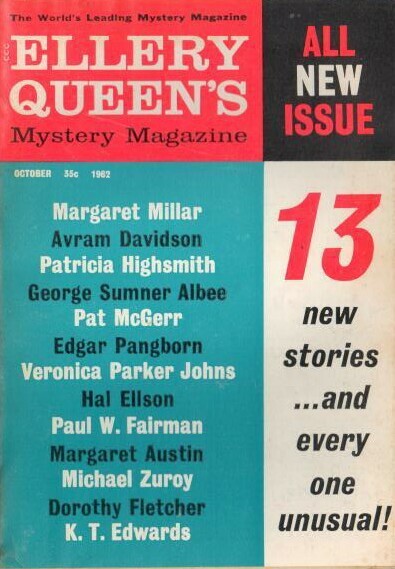 89 · Dear Mr. Queen, Editor · Marge Jackson · ss; in EQMMs Department of First Stories. Details supplied by Gary Garner. 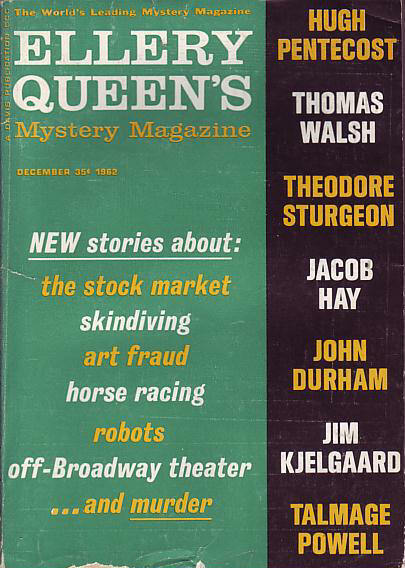 106 · The Miracle on Fifth Avenue · Olga Marx · ss; in EQMMs Department of First Stories.